The College Archivist has been supporting the work of the Black Cantabs Research Society, established to document and celebrate the early history of black students at Cambridge University, by researching Downing’s own early students. Research has been hampered by the poor survival of student records and photographs prior to the First World War, large gaps in our matriculation photographs before 1945 and Data Protection obligations. However, the project uncovered fascinating stories of individuals who went on to make significant contributions elsewhere. The earliest identified black student at Downing College was Benjamin Percy Quartey-Papafio, who matriculated in 1917 to study Medicine (pictured top left). His father, also called Benjamin, was a doctor from the Gold Coast who studied at Durham and Edinburgh, but little is known about his son's time in Cambridge. He does not appear to have completed his medical studies, taking only his first year examinations. (His father’s Wikipedia entry states that his son was unable to practice as a doctor due to failing eyesight caused by cataracts). In an exciting development after the completion of the Black Cantabs research project and exhibition, the 1917 matriculation photograph - previously missing from the archive collection - was sent in by the family of Frank Furniss, another medical student who matriculated at the same time (with grateful thanks to his family). Edmund was born in 1900 in Castries, St Lucia. He gained a Government Scholarship to St Mary’s College in Castries in 1912, where he was a member of the Cadet Corps and a School Prefect. 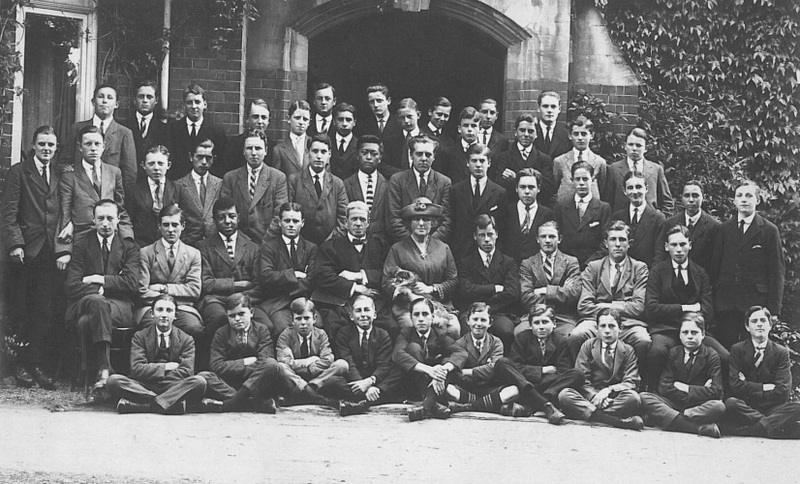 He was awarded the first ever St Lucia University Scholarship, introduced in 1918, before matriculating at Downing College in 1919 to study Medicine (pictured top, centre). (His Headmaster at St Mary’s College, John Desmond Fisher, was himself a recent graduate of Downing (matriculating in 1910), which may explain why he chose this College). During his time at Downing, Edmund represented the College at boxing, reaching the Bantam Weight final of the inter-collegiate competition in 1921. On graduating the following year, he went on to the Middlesex Hospital to complete his medical studies (at this time a Cambridge medical degree consisted of three years in Cambridge followed by the practical training undertaken in a hospital). In London, Edmund continued with his boxing, successfully representing the Middlesex Hospital. After qualifying as a doctor in 1925, he returned to St Lucia as Medical Officer for the Fifth District in Castries before leaving to take up a new post in the Gold Coast (now Ghana) in July 1927. Dr Auguste lived for the rest of his life in Koforidua in the eastern region of Ghana. He was the first qualified medical practitioner in this remote area and, as demand was high from the neighbouring villages, he established a weekly surgery in a nearby town on market day to provide medical care for a much wider community. He died in 1970. With grateful thanks to the Auguste family in Ghana for providing photographs and information about Dr Auguste's career and later life. The following is based primarily on the research of Dr David Pratten of the African Studies Centre at Oxford University, with thanks for his assistance. James matriculated at Downing on 22 October 1920. He took Part I in History before changing to Law Part II, graduating with an Ordinary BA in 1923. Sadly, no photographs of his time at Downing have survived. He was called to the Bar at Lincoln’s Inn Field in 1924. However, an illness rendered him totally deaf soon afterwards and he turned instead to a career in journalism, working on the Sierra Leone Daily Mail from 1932 to 1935 before settling in Calabar, Nigeria, as Editor of the Nigerian Eastern Mail established by his father. 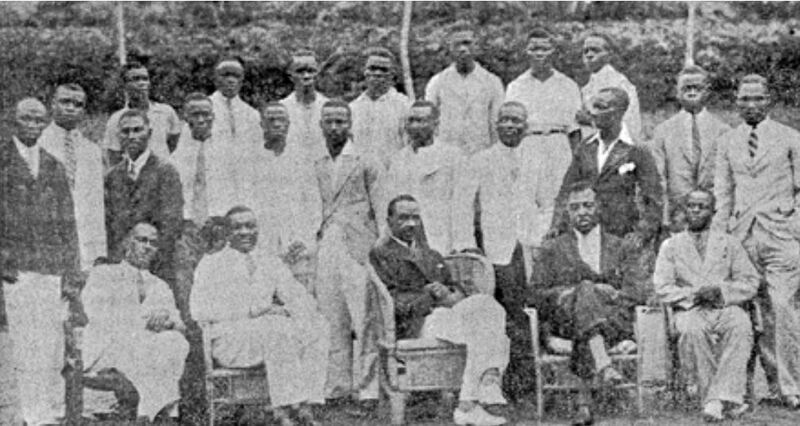 He is pictured below with the editorial staff of the Nigerian Eastern Mail in 1937 (J. V. Clinton is seated, second from right, and his father, the proprietor, is seated, third from right). In 1949 he was awarded an OBE for ‘services to Nigeria in the field of journalism’. After the Mail folded in 1951, Clinton held a number of posts in the Nigerian civil service throughout the 1950s and 1960s. Struggling to make ends meet, he began a new career writing short stories, often for women’s magazines under various pseudonyms. In 1971 he published ‘The Rescue of Charlie Kalu’ under his own name with the Heinemann Secondary Readers series for schoolchildren. He died in 1973. Interestingly, James Clinton’s family had close ties with the Urhobo Progressive Union in Nigeria which, in 1945, raised funds to send two students from the local community to university in England so that they might return after completing their degrees to run the newly-established Urhobo College. One of these students, Ezekiel Norukior Igho, matriculated at Downing in 1945 – perhaps because of this family connection – studying Natural Sciences. After graduating in 1948 and obtaining his Diploma in Education in London the following year, Igho returned to Urhobo to take up his position as Vice Principal at the new College. He is pictured here in the 1945 matriculation photograph (centre of the second row. DCPH/2/1/9: Image courtesy of Lafayette Photography Ltd). Family or school connections to Downing may explain why some students chose the College. Many early black students came from the Gold Coast or Nigeria, with several students in the 1950s and 1960s attending the same school - King's College in Lagos, Nigeria.